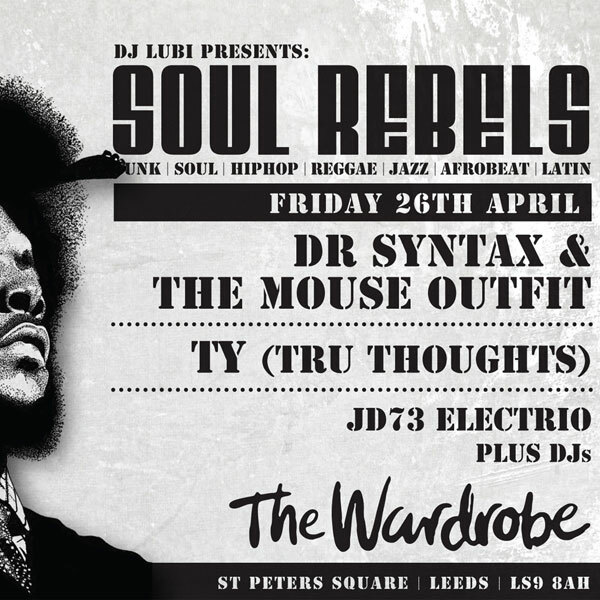 My flagship live music night in Leeds (UK), Soul Rebels Sessions, celebrates it’s sixth birthday on Saturday 6th October 2018 at The Wardrobe. 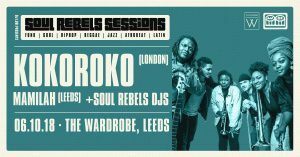 We have a great London-meets-Leeds party with afrobeat band Kokoroko (London) making their northern debut plus support from Leeds soul band Mamilah. Kokoroko feature on the 2018 Gilles Peterson/Brownswood Recordings London jazz compilation “We Out Here”, and Mamilah are the young Leeds soul band who skip the covers and are making original soul music. 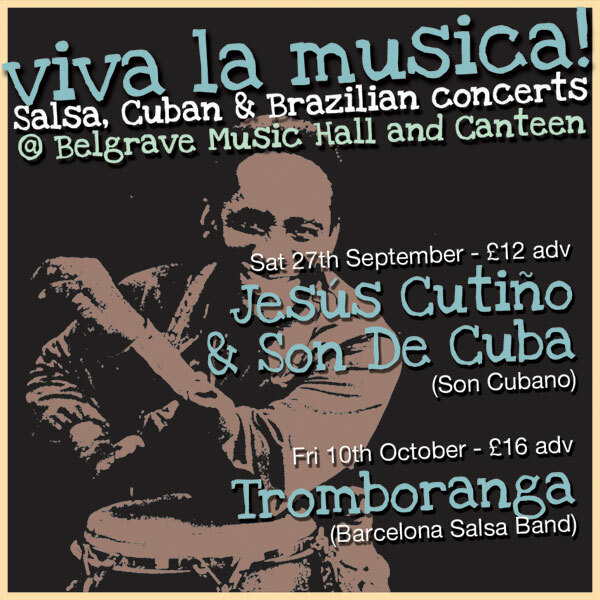 Check the calendar on this website for full gig info and ticket information and get down. So, I can’t believe it’s 6 years already! 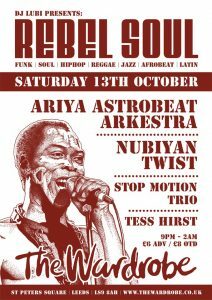 When I launched Soul Rebels (or Rebel Soul as it was known for the first 3 sessions), on Saturday 12th October 2012, I thought it might run for 6 months, maybe a year if lucky. I wasn’t promoting commercial music or big name acts, it was a local thing supporting Leeds artists and UK underground music acts. In reality, I wanted one place monthly where I could play and listen to the music I LOVE and not the music I have to play to make a living. It was never about money making or big profits, it was always about music first, supporting artists and building a musical community. It took off straight away with a sold-out launch party featuring Leeds/First Word Records afrobeat band Ariya Astrobeat Arkestra (musicians from ATA Records/Submotion Orchestra/Sons Of Kemet). Main support were a new young Leeds College Of Music band called Nubiyan Twist (now huge on the UK jazz/global beats scene). Other supports were a London singer called Tess Hirst (singer with London jazz double bassist Daniel Casimir), and a jazz trio called Stop Motion Trio featuring members of Paper Tiger/Noya Rao. First night sold out. Heavy duty live music played to a mainly young music college student crowd plus some older soul/jazz heads. Lovely night. Many smiles all round as we played the last record. Soul Rebels Sessions were born. Something new was happening. By 2013, I started to add international musicians to Soul Rebels shows. I never wanted to rely on big names and international acts so these shows tended to be stand alone gigs under the Soul Rebels brand. 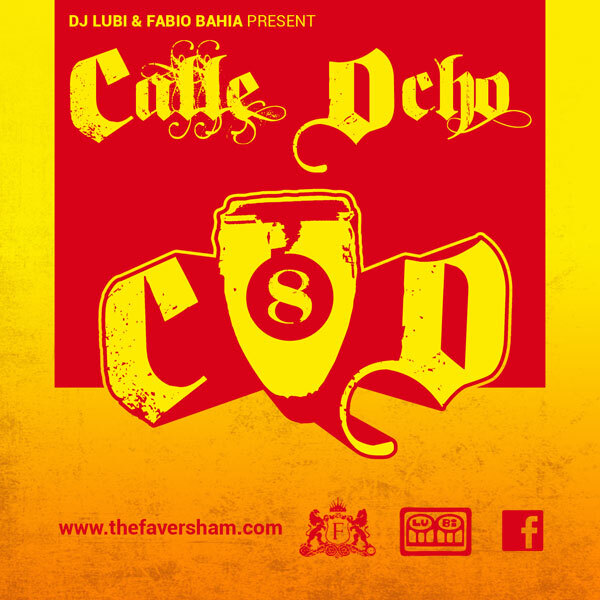 The regular events would continue to support local bands as much as possible. I also refused to go down the “big guest DJ” route. If I’m going to spend £5000 on an artist, I’d rather book a live band or two than a DJ any day. Soul Rebels grew steadily. I started doing stand-alone shows at other venues in Leeds as well as The Wardrobe. These included Belgrave Music Hall, Brudenell Social Club, Headrow House, Hifi Club and Hyde Park Book Club. 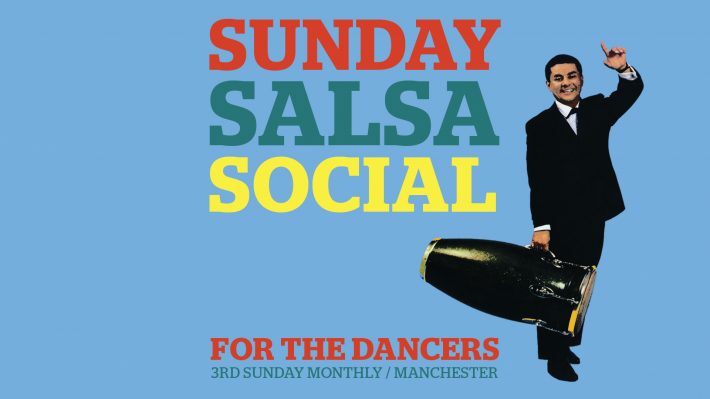 I also started doing co-promotions with some of Leeds top live music promoters, including Futuresounds, Superfriendz and Brudenell Social Club. Slowly but surely, the Soul Rebels vibe of jazz/global beats/neo-soul/hip-hop all under one roof started spreading across the city. In 2015, I launched RE:SOUL with saxophonist Jonny Faull, a monthly jazz/hip-hop/neo-soul jam session aimed at encouraging young musicians at Leeds’ music academies to get up onstage and jam with an experienced house band. 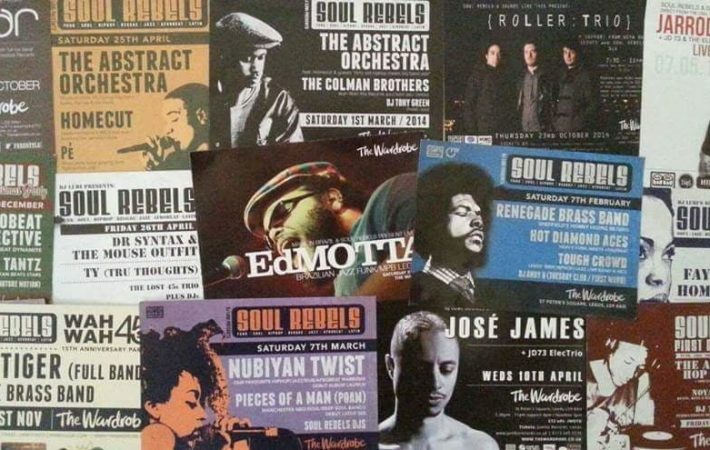 When I look at the bands who have played at Soul Rebels (either my gigs or co-promotions) over the last 6 years, I’m very proud of the list. I can’t remember every act or show but you get an idea of the artists who have played from the flyer collage at the top of this page. I’ll do another blog post to list all the acts who have played shows for me over the last 6 years. So many great shows. Amazing musicians and artists. And an audience who come down for THE MUSIC and not the cheap beer or free door entry or even for the pull. It’s refreshing when it’s music led. Thanks to all who have supported in the past and the present. 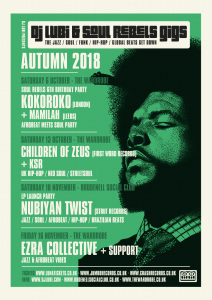 If you’re in Leeds, Yorkshire, the north or even beyond, get yourselves down on Saturday 6th October to The Wardrobe Leeds (UK) and help us celebrate 6 great years of live jazz/soul/afrobeat/funk/hip-hop/Brazilian music/Latin sounds with myself, DJ Chris Welch, Kokoroko and Mamilah. We’ll raise a glass to past achievements and look forward to the next 6 years too.